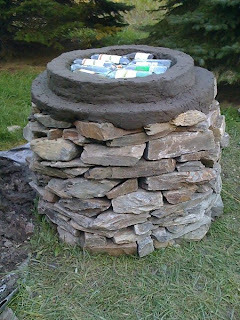 How to build an outdoor pizza oven using clay + sand (adobe) + straw (cob). Dave and Robin make pizza and bread in their oven, which they built themselves using an ancient, eco-friendly, natural, green, environmentally safe construction technique! 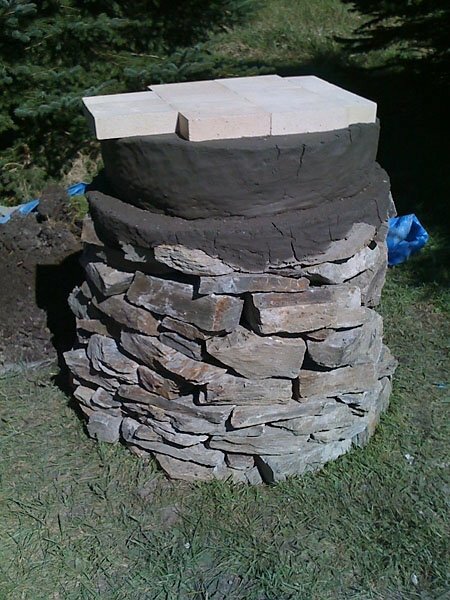 Build a 4" tall round slab of adobe on top of the stone base; this round slab will serve as the foundation for the oven itself. The diameter of the stone base is 48", so the foundation slab has a diameter of 48" too. 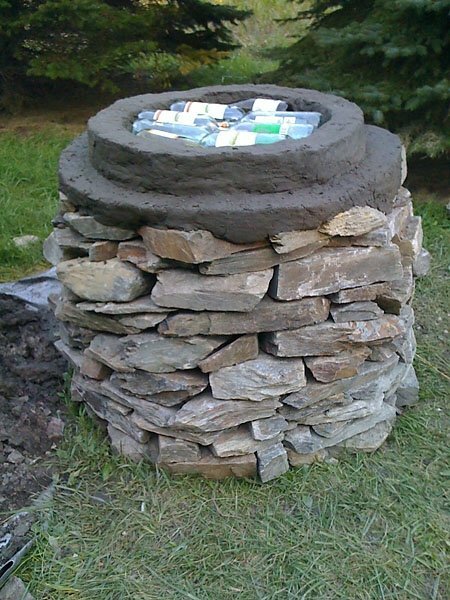 Next, build a ring of adobe on top of the slab. The diameter of the ring (measured from its outside edge) is 40", which means there's a 4" lip of the foundation exposed all the way around the ring. The walls of the ring should be 4" wide and 4" tall. Fill the ring with empty wine or beer bottles from your recycling bin. The bottles should be laid on their sides, with the necks in the center and the bottom of the bottles against the circumference of the ring. We found it best to use 1.5 liter wine bottles; each is about 4" tall when laid on its side, so it fills the 4" tall ring quite efficiently. This bottle-filled ring will act as an insulating layer below the oven floor. We don't actually know what happens to the glass bottles (do they break? do they melt?) -- but it doesn't matter. The purpose of the glass bottles is to form pockets of air between the oven floor and the stone base; when the adobe in the insulating layer dries, the air pockets will remain, regardless of what happens to the glass. The air pockets form an energy barrier -- this insulating layer prevents the stone base from stealing heat from the oven. Finally, it's time to cap the insulating area with -- you guessed it -- another layer of adobe, this one about 2" thick, so the insulating layer is about 6" tall. Hi, how many firebricks did you use? And were they the heavy duty or medium duty? Thanks! Would cement bricks be good for the oven floor?